Genetic genealogy confirmed my link to the Kirk surname and pinpointed Thomas Kirk and Sarah Louise Bonar as my 5th great-grandparents. Allegedly born in the late 18th century, poor record-keeping, burned courthouses, and a missing gravestone have all contributed to a shroud of mystery surrounding my patriarch. When was he born? Where was he born? Who were his parents? There are plenty of questions. The answers are less frequent or definitive. In June 1970, the Johnstown Genealogy Society conducted a census of burials in the Beard-Green Cemetery in Licking County, Ohio (Thomas' home county and final resting place). Society members reviewed the existing headstones and transcribed the engraved names and corresponding birth and death years. 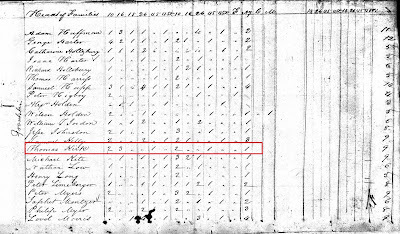 Thomas' name appeared in this burial census with the birth year of 1778 and death year of 1846 (See Thomas Kirk: Sourcing the Patriarch's Birth). Since Thomas' original headstone is now missing, this graveyard census is the only known documentation identifying his specific birth year. Of course, headstone engravings are not conclusive proof. Surviving grief-stricken family members often mis-remembered birth dates. Stone carvers frequently made mistakes. Was there another way to corroborate his purported birth year of 1778? Census records for Licking County help shine a light on some of these questions, including his approximate age. Their usefulness is hampered since US Federal censuses before 1850 only listed the name for the head of the household. All other occupants, including family members - spouse and children - were enumerated as a number under the column corresponding to their age. The challenge is to ensure that the household belongs to my Thomas Kirk and is not mistaken for another man by the same name and similar age in the area. 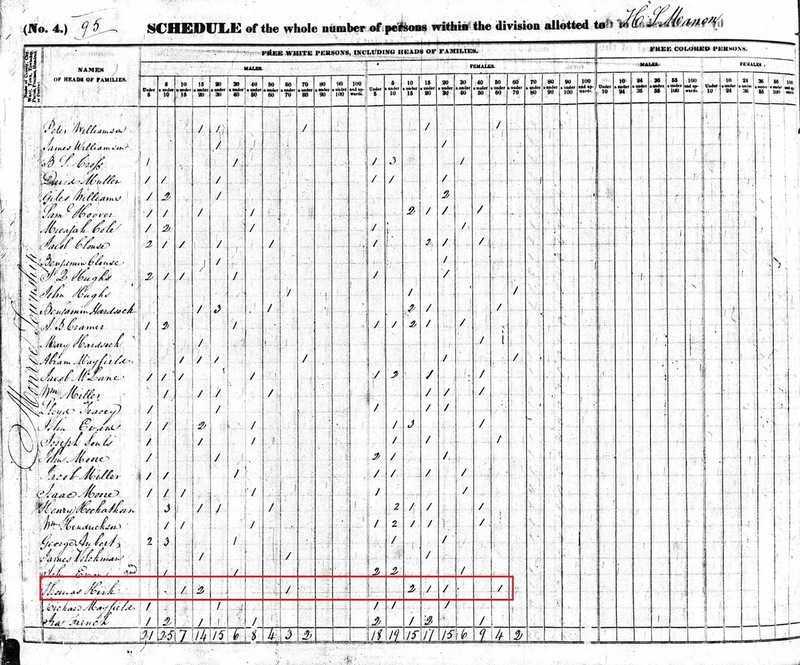 In the 1820 census, there were three Thomas Kirks enumerated in Ohio. One was over 45 years old and lived about 40 miles northeast of Licking County in Perry Township, Coshocton County. If he was exactly 45 at the time of the 1820 enumeration, he would have been born in approximately 1775 - close to the time my Thomas was born. The second Thomas was also over 45 years old but lived over 60 miles southwest of Licking County in Green Township, Ross County. In 1820, only one Thomas Kirk appeared in Licking County where my Kirks had known family roots. At that time, this particular Thomas lived in Franklin Township. 1820 Federal Census: Thomas Kirk in Franklin Township, Licking County, Ohio. 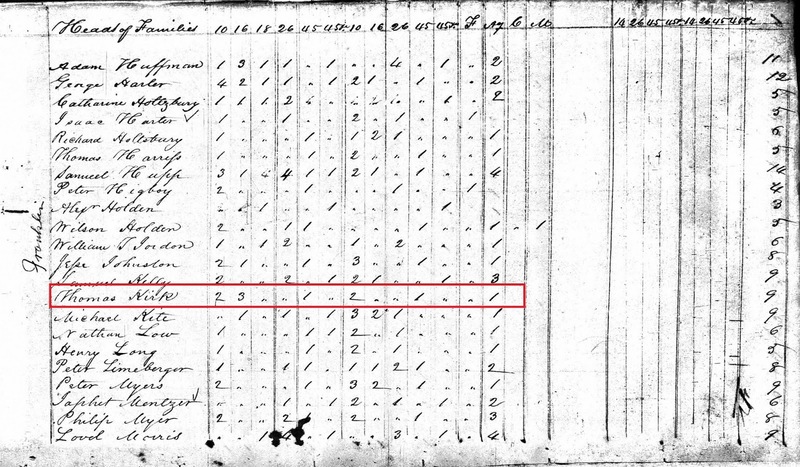 There were a total of nine people enumerated in Thomas' 1820 household. The oldest male, presumably Thomas as head of household, was between the ages of 26 and 44. If his purported birth year of 1778 was correct, Thomas would have been approximately 42 years old in 1820. That age fits within the parameters of the census and lends credibility to the oft-used birth year. 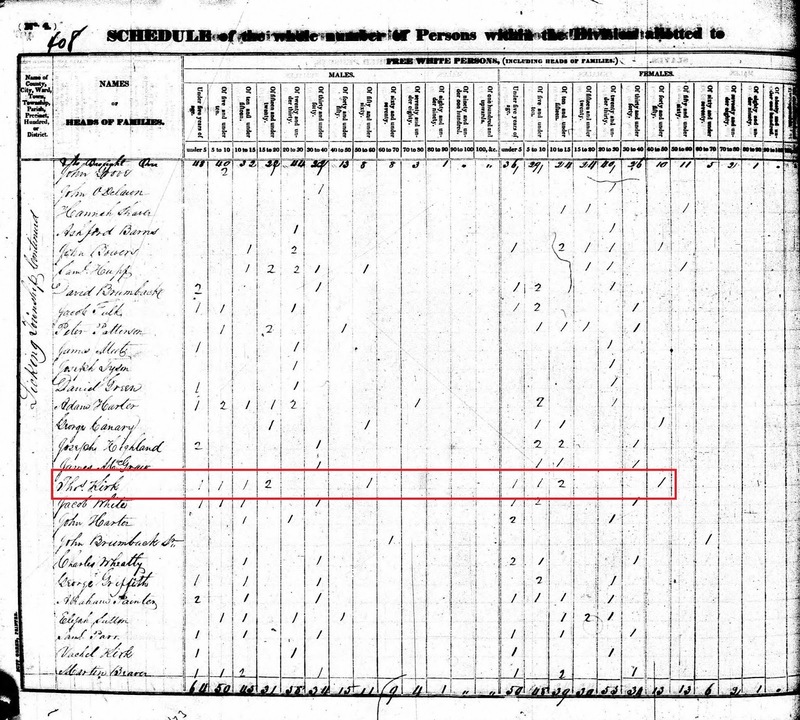 If we assume Thomas' third daughter Rachel, who family genealogies say was born in 1820, was born after August 7, 1820 (the date this census was conducted), there would have been seven children living in Thomas and Sarah's family at the time this census was enumerated. Based on reported birth years for his children, we can calculate their approximate ages and determine whether they align with the family enumerated above. The total number of family members and their corresponding ages fit and suggest that this is likely my Thomas Kirk in the 1820 census. Furthermore, this match allows us to confirm that Ohio's two other Thomas Kirks were not my man. The Coshocton County Thomas only had two people in his household, and the Ross County Thomas only had five people in his household. The 1820 census offered another interesting bit of information. There was no tick mark in the column for "Foreigners Not Naturalized" indicating that Thomas was either born in America, traveled here prior to the Revolutionary War when British citizens were not required to naturalize, or was a foreigner who had naturalized. There were three Kirks enumerated in the 1830 US Federal census who lived in Licking County: Thomas and his two eldest sons Vachel and William (both of whom were now married with children of their own). Curiously, Thomas' 1830 household included 11 individuals. With two of his children living on their own and two others dead in infancy (Andrew in 1809 and George in 1813), the household was one person larger than we would expect based on existing genealogies. Was there another child who died in infancy and did not make it into family pedigrees, or was there a relative living with the family? These are the challenges of the pre-1850 census records. The oldest male, presumably Thomas as head of household, was between the ages of 50 and 59. If his purported birth year of 1778 was correct, Thomas would have been approximately 52 years old in 1830. Again, that age fits within the parameters of the census and lends credibility to the oft-used birth year. Based on the children included in published genealogies, we would expect to find the following individuals in Thomas' 1830 household. Who was the girl under the age of five years? Some genealogies list a daughter named Sarah who was born in 1817 and died in infancy. A birth in 1817 would make Sarah about 13 years old in 1830 - too old to be the female child enumerated at the age of five. Yet another challenge resulting from the pre-1850 census records. 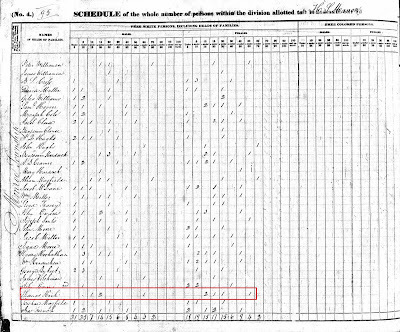 1830 Federal Census: Thomas Kirk in Licking Township, Licking County, Ohio. With the exception of the unknown girl, the total number of family members and their corresponding ages affirm that this was likely my Thomas Kirk in the 1830 census. In 1840, there were two Thomas Kirks enumerated in Licking County. My Thomas Kirk was now in the northwest corner of the county where he had moved to Monroe Township. Thomas Kirk Jr. was living independent of his father in Jersey Township. 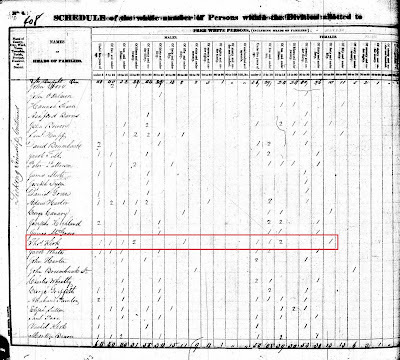 1840 Federal Census: Thomas Kirk in Monroe Township, Licking County, Ohio. Thomas Kirk Sr.'s household changed dramatically by 1840. According to published family history, his wife Sarah Bonar died in approximately 1835. Thomas remarried in 1837 to the recently widowed Anna (Bailey) Gilliland. Anna and her first husband David had nine children. In 1840, there were nine individuals who lived in Thomas' newly blended household. 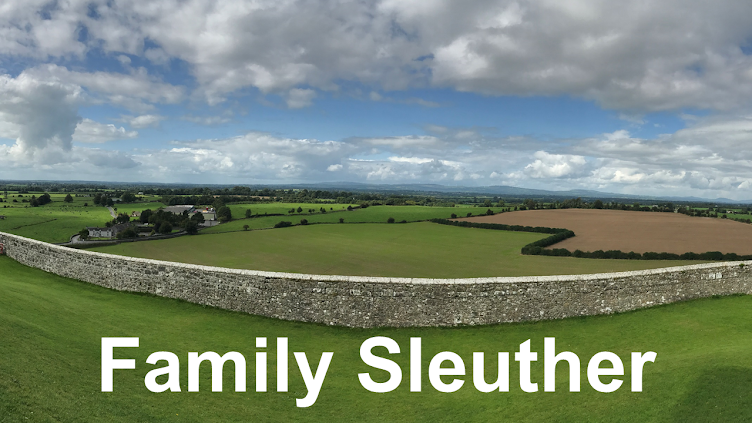 It seems likely that sons Hugh (14 years old) and Greenberry (19 years old) and daughter Rachel (20 years old and not yet married) were among those enumerated in the home. However, there were three other children in the household. Mindful of the newly integrated Kirk and Gilliland family, it's plausible that the additional children were from Anna's first marriage, including Lavina Bailey (b. 1828 and 12 years old in 1840) and Levi Bailey (b. 1823 and 17 years old in 1840). Without names enumerated for each of the individuals who lived in the household, it becomes very tricky to pinpoint exactly who was who. What remains most important for my purposes is to substantiate Thomas' approximate age. The oldest male, presumably Thomas as head of household, was between the ages of 60 and 69. If his purported birth year of 1778 was correct, Thomas would have been approximately 62 years old in 1840. Again, this age fits within the parameters of the census and lends credibility to the oft-used birth year. Collectively, the 1820, 1830, and 1840 censuses support the claim that Thomas was born in (or very near to) 1778. The preponderance of evidence seems to support the gravestone's engraving. But many questions still remain about my patriarch, including where was he born and who were his parents and what was their ancestral background? The investigation continues. Excellent sleuthing! :) It is often difficult to reconstruct families in the first half of the 1800s. You've made a convincing case for narrowing down Thomas's birth year. Thanks, Linda! I appreciate the vote of confidence. Fantastic! Thanks for sharing, Elizabeth. I appreciate it. Another suggestion and have used it extensively. CensusMate.com by John Haynes. You can put one families pre 1850 on one spreadsheet sheet to get a better idea what year boundaries they were really in. Each of my DL with pre 1850 census. Has a Censusmate spreadsheet. Better picture of information. Google it and you will see the different images. Thank you for pointing me to censusmate.com, Nettie. I quickly eyeballed the templates and see how this can help better illustrate the shape and evolution of families pre-1850.